In June 2001, Cardinal Bernard Law, the archbishop of Boston at the time, filed a response to allegations filed against Father John Geoghan, one of his former priests. Within the filing was the admission that in 1984, when he assigned Father Geoghan to a local parish, Cardinal Law was aware of previous molestation allegations against him. This filing also coincided with the appointment of Martin Baron (Liev Schreiber) as editor of The Boston Globe. Being from Florida and not having a Catholic background, he saw this peculiar event as an opportunity for the Globe to focus on local investigative journalism, part of his overall strategy for the paper. Thomas McCarthy's fast-paced, investigative biopic — itself operating like an efficient, muscular piece of journalism — depicts the work that the Globe's Spotlight team — Walter Robinson (Michael Keaton), Sacha Pfeiffer (Rachel McAdams) and Michael Rezendes (Mark Ruffalo) — did while uncovering the sexual abuse scandal within the Boston Catholic Archdiocese. Save the occasional moment of levity, all scenes are focused specifically on the fact-gathering expedition, with character backdrops existing only in a peripheral capacity, should they align with the investigation. While most are familiar with the outcome of the investigation — a Pulitzer Prize for the Spotlight team and roughly 150 priests, in Boston alone, standing accused of sexual abuse — the specifics of how it came to be are enlightening. 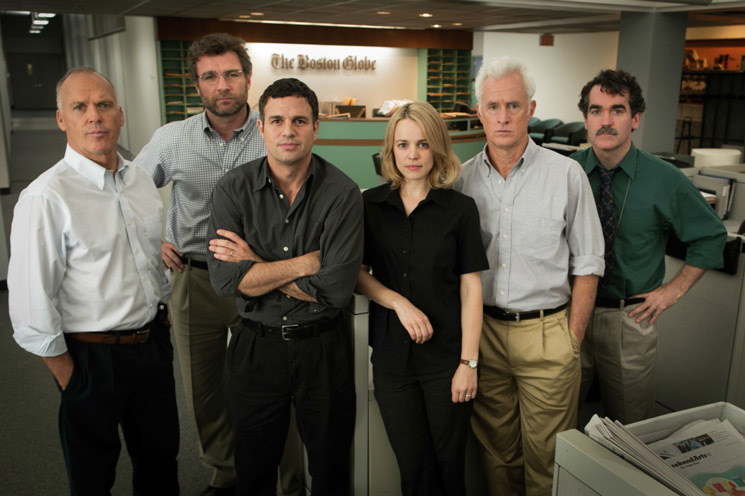 Spotlight details a cultural climate and political hierarchy of church-led influence in 2001 Boston; when Baron moves to Boston, the Cardinal immediately sets up a meeting to start what he presumes will be a copasetic, back-scratching relationship, not unlike one he presumably had with the previous editor. In fact, everywhere the Spotlight team turns leads them to someone connected to the church who is either demonstrating the sort of addictive and erratic behaviour associated with childhood sexual abuse or offering stern warnings against digging too deep. What Spotlight also does is imply aspects of the story through juxtaposition and narrative momentum rather than outright state them, should something not be a concrete fact. For example, the nagging sense that these sexual abuse cases should have been investigated by the Globe sooner, particularly when an abuse victim and a shady Archdiocese lawyer Eric MacLeish (Billy Crudup) both point out that they fed the paper proof of such years prior, suggests someone inside was suppressing the information. Though Ben Bradlee Jr. (John Slattery) was in a position to do something when this proof came in, it's never outright stated that he or anyone else deliberately buried the story. Similarly, while Rezendes, as portrayed by Ruffalo in the standout performance of Spotlight, has the nervous energy and seemingly self-destructive sensibility of an abuse victim, it's never outwardly asserted that he too might have been a victim. McCarthy, despite exploiting every scene for character complexities, is careful to stick to facts, and it's vital to the success of this film that he does so. In part, this intelligent adult drama is a testament to the days of responsible reporting. Though blogging isn't a factor in Spotlight, there's the unspoken understanding that this story would have been handled disastrously nowadays. Each tidbit would be released to the public as it was unearthed, allowing the Catholic Church to refute and distort the facts or shift the focus elsewhere. If McCarthy were to fudge the facts or embellish too much (some of the events in the film, such as personal threats against the journalists, could have been made up at some point along the way), his film would ultimately derail this message and itself be the sort of tawdry sensationalism that it indirectly criticizes. Fortunately, it maintains its integrity and tells its story without resorting to histrionics or hyperbole. It's true that it's highly expository and not particularly cinematic by sheer merit of what it's attempting, but this clever bit of storytelling ultimately succeeds in its very specific aims. This is a wholly engaging work of social importance.